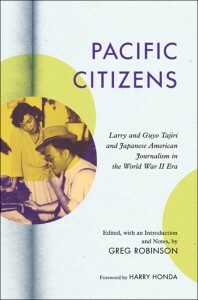 “Pacific Citizens: Larry and Guyo Tajiri and Japanese American Journalism in the World War II Era” has been published by University of Illinois Press. The book is edited, with an introduction and notes, by Greg Robinson. The foreword is by Harry Honda. Offering a window into a critical era in Japanese American life, “Pacific Citizens” collects key writings of Larry S. Tajiri, a multitalented journalist, essayist, and popular culture maven. He and his wife, Guyo, who worked by his side, became leading figures in Nisei political life as the central purveyors of news for and about Japanese Americans during World War II, both those confined in government camps and others outside. The Tajiris made the community newspaper the Pacific Citizen a forum for liberal and progressive views on politics, civil rights, and democracy, insightfully addressing issues of assimilation, multiracialism, and U.S. foreign relations. Through his editorship of the Pacific Citizen as well as in articles and columns in outside media, Larry Tajiri became the Japanese American community’s most visible spokesperson, articulating a broad vision of Nisei identity to a varied audience. In this annotated volume, Robinson interprets and examines the contributions of the Tajiris through a selection of writings, columns, editorials, and correspondence from before, during, and after the war. “Pacific Citizens” contextualizes the Tajiris’ output, providing a telling portrait of these two dedicated journalists and serving as a reminder of the public value of the ethnic community press. Robinson is an associate professor of history at the University of Quebec, Montreal, and the author of several books, including “A Tragedy of Democracy: Japanese Confinement in North America” and “By Order of the President: FDR and the Internment of Japanese Americans.” He writes a column for the San Francisco-based Nichi Bei Weekly. Honda was a staff member of the Shin Nichibei before becoming editor of the Pacific Citizen when it moved from Salt Lake City to Los Angeles in 1952. He served the JACL newspaper in various capacities until 2002.